The all new Wave system has been thoroughly reimagined to improve bathing and showering – for the user and the carer. Responding to requests from therapists and carers, Rifton widened these new bath chairs to accommodate larger users. And to protect skin integrity they added generous padding under soft knit fabric. As well as mounting the bath chair on a tub stand or rolling shower stand there is the option of an ingenious new tub transfer base (available in summer 2017) to completely change the way you transfer and bathe larger users. There’s nothing like it. 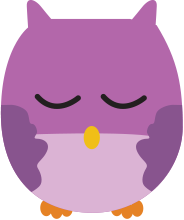 Before our designers started redesigning the Wave, they asked therapists and providers what they wanted. More width was the number one request. Along with a wider chair it also offers additional padding to make it even more comfortable and gentle on sensitive skin. The Wave is truly tool free, not only for initial assembly but also for all adjustments, many while in use. 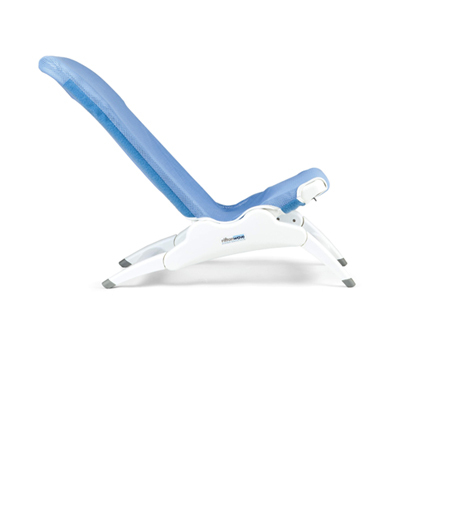 The backrest angle can simply be adjusted with one hand which allows the carer to keep the other hand on the user for safety and reassurance. The system starts with the chair itself, available in small, medium and large. 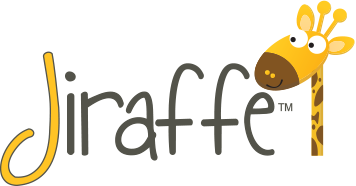 There are many base options dependant on the required use for the product. 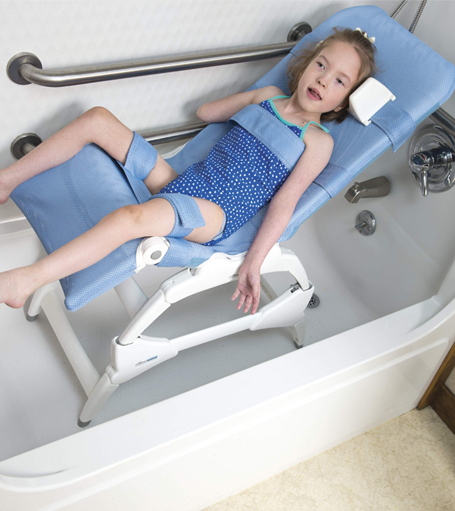 Base options include a bath stand, shower stand with wheels and and a back-saving rotating transfer base to easily position the user over the bath to facilitate showering. 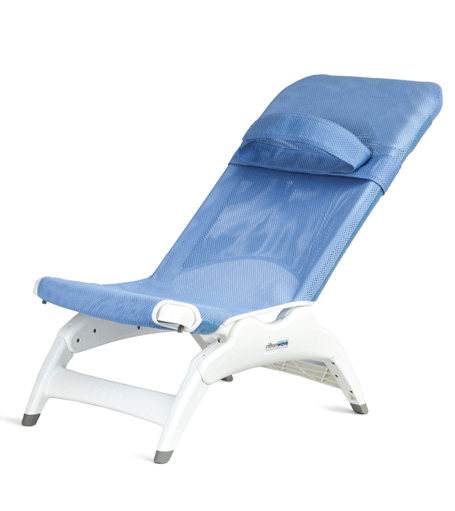 The calf rest option provides more support for the lower legs and is especially needed when the bath chair is used on one of the stands. The calf rest must be chosen at the time of the original purchase. It cannot be added later. 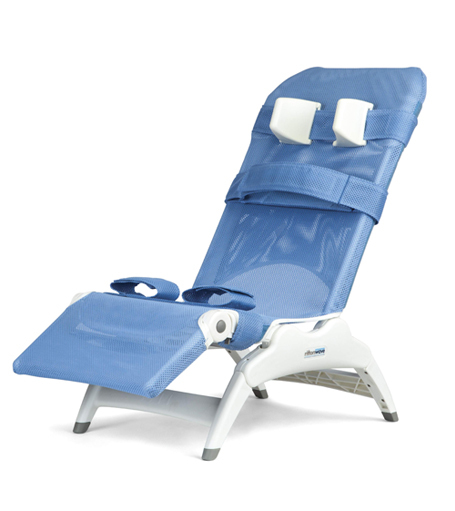 The simple chest strap positions the user in the Wave bath chair. 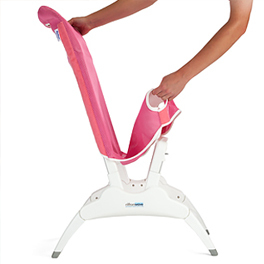 It attaches with hook and loop anywhere along the full height of the back and buckles securely behind. The simple chest strap provides minimal lateral positioning and is best used with users who are able to maintain their own trunk alignment. 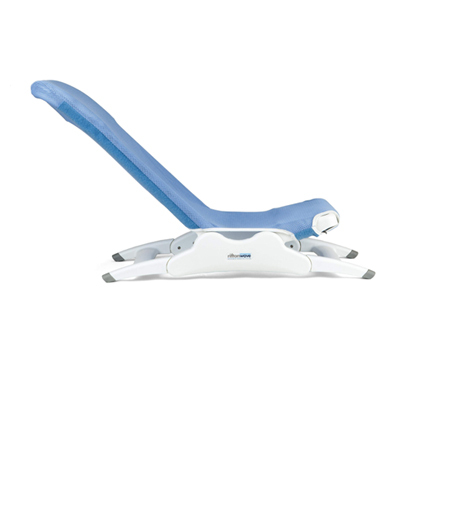 The chest strap with lateral positioning was designed with adjustable straps that give additional lateral support to help users maintain better trunk alignment and unlike the laterals on most bath chairs, Rifton’s soft fabric laterals will not get in the way during transfers. 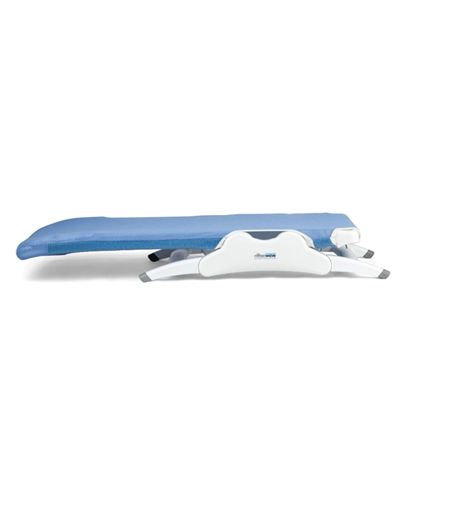 Optional head blocks provide lateral support and positioning for the user’s head. The soft plastic head blocks are on a strap that can be positioned at any height on the back rest. Aside from providing positioning support for clients with poor head control, head blocks can also give the client a feeling of security. The leg straps are sewn from the same soft fabric as the chair. They attach anywhere on the seat and are secured with a buckle. 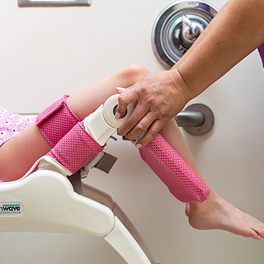 Each leg can be secured individually with a hook and loop closure. Use the fully adjustable leg straps to position the users hips in abduction or just to provide additional security. 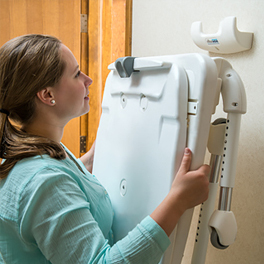 The shower stand allows you to roll the user into the shower at a height that enables better cleaning – and saves the carers back. It can be used with any of the three chair sizes and has rugged, smooth rolling, locking casters. Quick-release locks on the stand allow easy attachment and removal of the chair. The tub stand can be used with all three chair sizes and raises the chair either 140mm or 292mm allowing safer transfers and caregiver assistance during bathing. All adjustments are tool free. 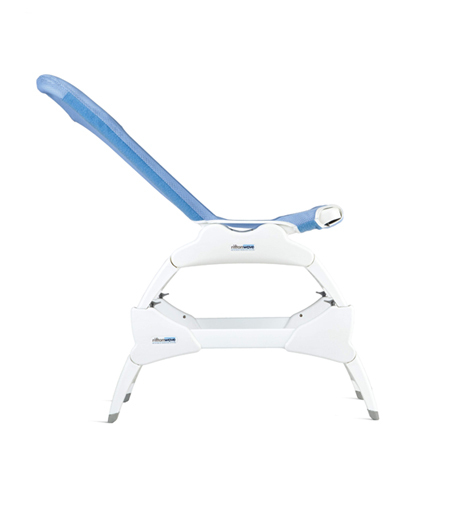 Both stand and chair have slip-resistant feet for stability in the tub. The tub stand legs also fold flat for storage. 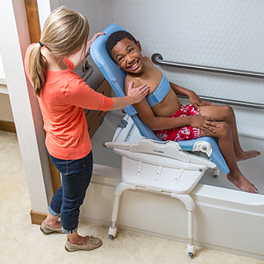 Quick-release locks allow bath chair to be attached or removed from the tub stand without using tools. The ingenious tub transfer base is ideal for the large or heavy user who needs an over-the-tub shower. It’s much more gentle on your back, too! With the Rifton tub transfer base you can perform healthy transfers – either manually or with a mechanical lift – without crowding your bathroom with permanently mounted equipment.